One of the most renowned authors of the twentieth century, Thomas is as well known for his life of excess as for his iconoclastic, critically acclaimed writings. Often focusing on such universal concerns as birth, death, love, and religion, Thomas’s works remain distinctly personal through a blend of rich metaphorical language, sensuous imagery, and psychological detail. Growing Up in Wales. Born in a suburb of the port of Swansea, on the southern coast of Wales, Thomas was the second child and only son of middle-class parents. His father, an English teacher who had a great love for literature, encouraged similar devotion in his son, even going so far as to read the works of Shakespeare aloud to the infant Thomas in his cradle. Such efforts were rewarded when Thomas began writing verse at an early age. He was an otherwise undistinguished student, however, and left school at sixteen to work for the South Wales Daily Post in Swansea. Thomas continued to compose verse while working at the Post. When he resigned from the paper early in 1933, poetry became his primary occupation. It was at this time that Thomas began to develop the serious drinking problem that plagued him throughout the remainder of his life and resulted in his death at the age of thirty-nine. His notebooks reveal that many of his most highly regarded poems were either written or drafted during this period and that he had also begun to experiment with short prose pieces. In May of 1933, his poem ‘‘And Death Shall Have No Dominion’’ was published in the New English Weekly, marking the first appearance of his work in a London journal, and in December of the following year his first poetry collection, Eighteen Poems (1934), was issued. Although this book attracted little attention, Thomas’s second volume, Twenty-five Poems (1936), fared somewhat better, and as the decade progressed he gained increasing recognition for both his poetry and his prose. Marriage and a Nomadic Life. In the summer of 1937, Thomas married Caitlin Macnamara, an aspiring dancer of Irish descent whose reputation for unconventional behavior rivaled Thomas’s own. For the next twelve years the couple led a nomadic existence, staying with friends, relatives, and a series of benefactors. The stories later collected in Portrait of the Artist as a Young Dog (1940) were written primarily during their stay in the Welsh coastal village of Laugharne in late 1938 and early 1939. Too frail for active military service, Thomas wrote scripts for propaganda films during World War II, at which time he also began to participate in radio dramas and readings for the BBC. His hometown of Swansea was targeted by German bombers during air raids in 1941, and a large urban portion of the town was completely destroyed. He later wrote about witnessing the aftermath in the radio drama Return Journey Home. Thomas emerged from the war years a respected literary figure and popular performer; however, his gregarious social life and the excessive drinking it encouraged seriously interfered with his writing. Seeking an environment more conducive to poetic production, Thomas and Caitlin returned to Laugharne in 1949. 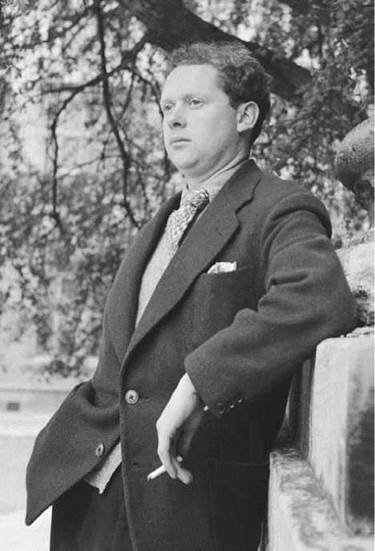 During the early 1950s, Thomas wrote several of his most poignant poems, including ‘‘Do Not Go Gentle into That Good Night’’ and ‘‘Lament.’’ He also completed the radio drama Under Milk Wood (1954) and began work on an autobiographical novel, which was left unfinished at his death and published posthumously as Adventures in the Skin Trade (1955). Nevertheless, he feared that his creative powers were rapidly waning, and, partly in an attempt to avoid the pressures of writing, he embarked on a speaking tour of the United States in the spring of 1950. A highly charismatic speaker, Thomas charmed American audiences with his readings and shocked them with his often wild, irresponsible behavior. Beyond Poetry. Thomas focused on writing prose and screenplays during the last years of his life. Previous to this period, his most important prose appeared in the semiautobiographical short stories, Portrait of the Artist as a Young Dog, which stylistically and thematically bear comparison to Joyce’s Dubliners and Portrait of the Artist as a Young Man. The most significant prose piece to issue from Thomas’s later period is the ‘‘play for voices,’’ Under Milk Wood. Thomas went to the United States on lecture tours four times, beginning in February 1951, leaving his home for the four and a half years before his death. In 1953, Thomas fell into a coma due to ailments complicated by alcohol and drug abuse. He died four days later, leaving behind a mound of debts that private contributions helped to pay. Igor Stravinsky (1882-1971): Stravinsky was a Russian composer famous for his music for the ballets The Rite of Spring (1913) and The Firebird (1910), and is widely considered to be one of the most influential composers of the twentieth century. John Cage (1912-1992): Cage was an American avant- garde composer who was instrumental in the development of modern dance and electronic music. John Berryman (1914-1972): Berryman was an American poet who was one of the founders of the confessional school of poetry. Shirley Jackson (1916-1965): Jackson was a popular and influential American writer of novels and short stories best known for ''The Lottery'' (1948). Jack Kerouac (1922-1969): Kerouac was an influential American poet and novelist who was part of the Beat generation; he is most famous for his semiautobiographical novel On the Road (1957). Passionate and intense, vivid and violent, Thomas wrote that he became a poet because ‘‘I had fallen in love with words.’’ His sense of the richness and variety and flexibility of the English language shines through all of his work. The theme of all of Thomas’s poetry is the celebration of the divine purpose that he saw in all human and natural processes. The cycle of birth and flowering and death suffuses his poems. He celebrated life in the seas and fields and hills and towns of his native Wales. In some of his shorter poems, he sought to recapture a child’s innocent vision of the world. Words and Style. Thomas set a new standard for many mid-twentieth-century poets through works that display his mastery of vivid imagery, involved word play, fractured syntax, and personal symbology. He was passionately dedicated to his ‘‘sullen art,’’ and he was a competent, finished, and occasionally intricate craftsman. He made, for example, more than two hundred versions of ‘‘Fern Hill’’ before he was satisfied with it. Like James Joyce before him, Thomas was obsessed with words— with their sound and rhythm and especially with their possibilities for multiple meanings. His early poems are relatively obscure and complex in sense and simple and obvious in auditory patterns. His later poems, on the other hand, are simple in sense but complex in sounds. Depictions of Wales One key element in Thomas’s works is his depiction of his native Wales. His radio play Under Milk Wood is an example of this work, as a pageant of eccentric, outrageous, and charming Welsh villagers reminisce about the casual and crucial moments of their lives. This is also shown in Return Journey Home, where he describes the devastation of Swansea by German bombers during World War II. Old Age and Death Thomas frequently utilizes the notion of the cycle of life by contrasting young and old or living with dying. This is shown in his most famous poem, ‘‘Do Not Go Gentle into That Good Night,’’ where the narrator advises a dying person to fight back against the onset of death, with the emotion of rage being equated with life. It is also shown in his poem ‘‘Fern Hill,’’ found in the aptly named collection Deaths and Entrances. In the poem, Thomas begins by relating the experiences of youth, and concludes with an aged narrator lamenting his coming death. Though Thomas generally depicts death and old age negatively, his poem ‘‘And Death Shall Have No Dominion’’ offers a hopeful view of life after and beyond death. From the outset of Thomas’s career there has been much critical disagreement as to his poetic stature and importance. Many commentators regard Thomas’s work as too narrow and unvarying; he essentially confines himself to the lyric expression of what Stephen Spender calls ‘‘certain primary, dithyrambic occasions,’’ chiefly birth, love, and death. The influence of the seventeenth-century metaphysical poets is often cited in connection with Thomas’s unorthodox religious imagery, while the influence of the Romantic poets is seen in his recurrent vision of a pristine beauty in childhood and nature. Dylan Thomas’s life, work, and stature among twentieth-century poets are all matters of controversy and speculation. An essentially shy and modest man when sober, Thomas called himself the ‘‘captain of the second eleven’’ on the team of modern poets, an uneasy, pivotal ranking between the clearly major and the clearly minor poets. Others, too, such as John Crowe Ransom, have found difficulty in formulating a final opinion of Thomas: Is he really only the best of the minor poets—those who achieve distinction within inherited modes and procedures—or is he the weak man, if that, among the major poets—those who absorb the tradition of ideas and forms that they then in some way radically change? Poetry Collections. The critical reception that greeted Eighteen Poems was overwhelmingly positive; reviewers sensed in Thomas a highly unique yet traditional poetic voice. In many of these poems Thomas drew upon his childhood and adolescent experiences. Often described as incantatory, Eighteen Poems records Thomas’s experimentations with vibrant imagery and with sound as ‘‘verbal music.’’ Thomas’s brilliant debut—and subsequent brief career and life—would later prompt comparisons to the short, dazzling, and ultimately tragic career of American poet Hart Crane, who drowned himselfin 1932. Twenty-five Poems contains many of the same themes as his first work. William York Tindall referred to Thomas’s first two books as the poet’s ‘‘womb-tomb’’ period because of his penchant to focus on the polarity of birth and death. Critics also noted that Thomas frequently questions or comments upon religion, using images and terminology from Christian mythology, history, and doctrine. ‘‘And Death Shall Have No Dominion’’ was considered by many critics to be a breakthrough work in Thomas’s career. In it, the poet addresses the Christian ideas of life and death, ultimately defying death and celebrating the possibility of eternal life. Another acclaimed poem, ‘‘Altarwise by Owl-Light,’’ is a sequence of ten sonnets discussing the crucifixion of Christ. Both poignant and comic, the sequence is generally regarded as one of Thomas’s best works. ''Death of a Naturalist" (1966), a poem by Seamus Heaney. This poem details the exploits and thoughts of a young boy collecting frogspawn in a flax-dam. ''The Drunken Boat'' (1871), a poem by Arthur Rimbaud. This poem is well known for both its surreal, dazzling imagery and its symbolism. The Golden Age (1895), stories by Kenneth Greene. This collection of stories represents children as having perception that is far superior to that of the unimaginative, pleasure-stifling adults. Walden (1854), a nonfiction work by Henry David Thor- eau. Thoreau spent two years living in a cabin in the Massachusetts woods in order to gain perspective on human society for this work. 1. Thomas was known for his inspired performances, his entertaining public personality, and his colorful personal life. As a class, discuss whether Thomas’s poems would be as interesting on their own. How much did his personal mystique contribute to the positive reception of his works? 2. Read several of Thomas’s poems from Twenty-five Poems. Choose one and write a brief analysis of the poem’s rhythm and theme. Point out any evidence of mysticism or religion that you can find in the poem. 3. Critics and readers have noted that Thomas’s prose and scripts draw heavily on the author’s life. Attempt to re-create some of Thomas’s life by identifying autobiographical details in his prose and poetry. 4. Thomas’s reading tours in the United States in the early 1950s won him great acclaim. Write an essay tracing the impact of his trips to the United States on his later works. Ackerman, John. Dylan Thomas: His Life and Work. Basingstoke, U.K.: Macmillan, 1990. Brinnin, John Malcolm. Dylan Thomas in America. Boston: Atlantic/Little, Brown, 1955. Davies, Walford. Dylan Thomas. Cardiff: University of Wales Press, 1990. Gaston, Georg M. A. Critical Essays on Dylan Thomas. Boston: G. K. Hall, 1989. Jones, Gwyn. Background to Dylan Thomas, and Other Explorations. Oxford: Oxford University Press, 1992. Thomas. Ithaca, N.Y.: Cornell University Press, 1966. Peach, Linden. The Prose Writing of Dylan Thomas. Basingstoke: Macmillan, 1988. Read, Bill. The Days of Dylan Thomas. London: Weidenfeld & Nicolson, 1964. Rolph, J. Alexander. Dylan Thomas: A Bibliography. London: Dent, 1956. Sinclair, Andrew. Dylan Thomas: No Man More Magical. New York: Holt, Rinehart & Winston, 1975. Bruns, Gerald L. ‘‘Daedalus, Orpheus, and Dylan Thomas’s Portrait of the Artist.’’ Renascence, Spring 1973. Davies, Richard A. ‘‘Dylan Thomas’s Image of the ‘Young Dog’ in Portrait. ’’ Anglo-Welsh Review, Spring 1977. French, Warren. ‘‘Two Portraits of the Artist: James Joyce’s Young Man; Dylan Thomas’s Young Dog.’’ University of Kansas City Review, June 1967.